What is it about spring that makes us want to clean or clean out everything? Is it the fact that the days are longer, the sun brighter and we can see the cobwebs and dust bunnies that have accumulated over the winter? Regardless of the reason, spring seems to be a time to clean out, organize, throw out, and give away. Some of you may have watched or heard of the television program Hoarders. A reality program about people who have accumulated “things” they don’t need, can’t possibly use, and do not have the space to keep. It eventually reaches a critical point. I have to admit I have some hoarding tendencies - - perhaps it’s just a drawer for you, or a room, or even your whole house. . . I have a feeling I’m not alone in this. Today’s verse reminds us not to accumulate beyond what we need. 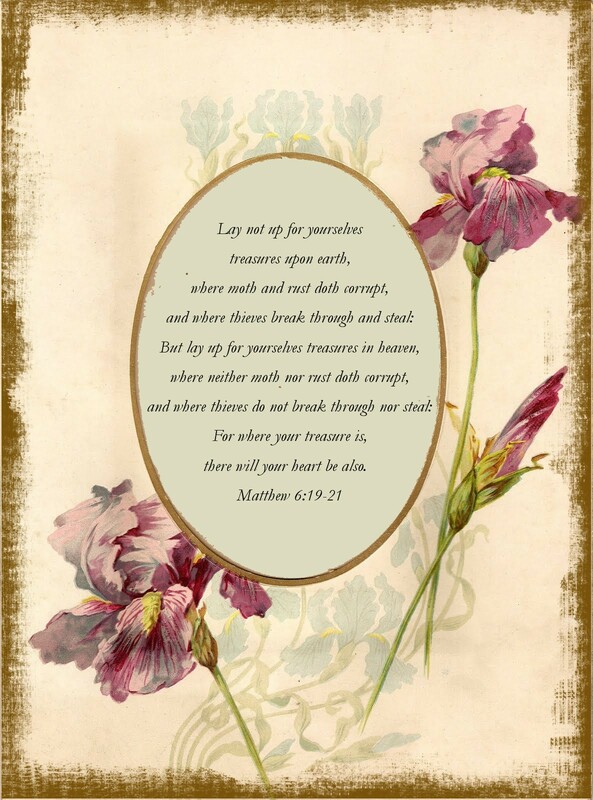 Jesus doesn’t want our treasure to lie in our temporary possessions. He tells us - where our treasure is, that’s where our heart will be. He wants our heart to be focused on heavenly things. If we place our hope in Him as our treasure, our hearts will be focused in the right direction. Join me this spring and let’s purge our excess possessions and focus our hearts on the heavenly treasure we’re promised. ought we not to give earnest thought to our staggering surplus? I made today's scripture graphic from a free image at The Feathered Nest. Thank you Dawn for all the goodness that you share. I'm linking up with you this week. Hope I did it right! I've had today's post scheduled for several days...it seems we're both thinking similar thoughts these days. I'm continung to pray for you and your hubby. Yes, Abby I also need to do some cleaning and I just love that there is nothing on this earth that I need to be a child of God! I just need Jesus. Wonderful devotion dear friend. Hope to be able to play at some point this week as busy has overtaken me! What a timely reminder to lay up treasure in Heaven, and to hold the things of earth loosely. Thanks for the pretty freebie as well -- your creations are always so pretty! I thought I had linked this one last week, so I linked it now. Hope that is OK Abby! You've done a beautiful job once again of sharing some thing that is lovely to both to eye, and to the heart. May God bless you for sharing His love through art. You are such a tremendous blessing to me! I LOVE your site Abby, and I've been so excited to receive it. This is a lovely way to frame and enjoy this wonderful scripture. Thanks for your efforts in making life better for so many of us. We are all thinking alike these days... I am eager to get rid of it, though my stamina is waning. I want a nap! Thank you so much for this timely word. Sometimes when God blesses us beyond measure, we get caught up in storing earthly treasures. I too have some cleaning out to do. This is a wonderful verse. Thank you for reminding me. Thank you for linking to Think on These Things, Abby! Love the old look on the card. Wonderful verse and very wise reminders, Abby. I'm not a hoarder at all, I'm actually the opposite, a HUGE believer of less is best. Problem is I live with three other people. ;) But they're not too terrible. I think we're down to one messy kitchen drawer that I'm hoping to tackle this week because I organized my entire kitchen last week. I think it is amazing that even though I organize so often, a little clutter finds its way back if I'm not careful. You can also overdo it with perfection so there has to be a good balance. I've watched Hoarders and every single time I finish one episode, I get up and start organizing and getting rid of excess even where there's none. ;) I feel so terrible for those folks. I used to volunteer for the Alzheimer's Association and in many of their seminars I'd hear experts speaking about how important it is to remove excess for a healthy mind. They actually recommend having fewer items and furniture pieces for loved ones suffering from AD, but I think it is very beneficial to everyone. Thank you for sharing. Always great to stop by.